Agios Nikolaos (Άγιος Νικόλαος) is a small town with less than 20,000 inhabitants. permanent residents (according to statistical data from 2001). This city is the capital of the Lasithi nomos. It is located in the central-eastern part of Crete, about 65 kilometers east of Heraklion . It is one of the first tourist resorts in Crete. Already in 1965, much earlier than in other cities of this island, the first hotel was opened here. Currently, Agios Nikolaos does not play such an important role in servicing tourist traffic in Crete, as it did years ago. Despite the fact that the city must now compete with other towns located in this area of ​​Crete (such as Plaka, Elounda , Istro, Kalo Chori), every year thousands of tourists rest here from all corners of Europe. Agios Nikolaos is a place with a very contemporary appearance with a predominance of modern buildings. Unlike other major cities of Crete, it is in vain to find visible remnants of ancient cultures or the presence of Venetians. However, this should not fool you, because the genesis of the Agios Nikolaos origin dates back to the Dorian period, when the port of Lató Etéra, closely related to the ancient town of Lato, was located in this place. From the 3rd century BC up to the 6th century AD Lató Etéra is a dynamically developing center of trade. This status was also maintained during the reign of the Romans and in the early period of Byzantium. In the 13th century, the port was conquered by the Genoese and the Venetians who renamed it to Porto San Nicolae. In 1206 they built a small fortress, which because of the beautiful view extending from its walls was called Mirambello (a beautiful view). To the present times, no remains of these fortifications survived, the only trace of its presence is the name of the nearby bay, which is still called Mirambello. The Venetian stronghold was at the top of the hill where the prefecture building now stands. At the time, the Venetians controlled trade and salt mining in the Mediterranean. This raw material was one of the most important ones that were then rotated. Control over the salt trade, which was acquired in the town of Elounda , a few kilometers north, is one of the main tasks of this fortress. Only when the Venetians built a completely new port in the area of ​​Elounda did the importance of Mirambello significantly decrease. In 1303, Mirambello was ruined by a strong earthquake. In 1537, the fortress was ravaged and destroyed by pirates. In both cases, the fortifications were rebuilt by the Venetians. Ultimately, the fate of Mirmabello was sealed by the Ottoman-Venetian conflict, during which, after a long-lasting siege by Turkish troops, the remains of the destroyed fortress were blown up by the retreating Venetians. During the Turkish occupation, the city clearly loses its importance until it is completely abandoned. During this period, however, the port is still being used, and abandoned buildings (including churches) are used as warehouses for goods transported from this region of Crete. Only at the end of the Turkish occupation, after the uprising in 1866, people began to return to this town. Several people from Sfaki, merchants from eastern Crete and people from nearby Kritsa , are the first inhabitants of the ruined Mandraki village. It is this place that created the foundations of modern Agios Nikolaos. The main source of income for the then Mandraki residents was the sale of citrus fruit. The importance of this trade for the development of Agios Nikolaos, let it be that the central district of this place is called Kitroplateia (Plac Cytrusów). One of the most characteristic places of this city is the Voulismeni lake located in the central place of Agios Nikolaos. Currently, this basin forms a natural haven for small fishing boats that moor along its shores. Until 1870, when the canal connecting the lake and the sea was dug, Voulismeni was an independent freshwater reservoir. According to the legend, the goddess Athena took baths in this place. The picturesque location of thisa small lake, which on the one hand is surrounded by steep rocks, made many taverns, cafes and restaurants on its opposite bank. You can taste all kinds of Greek specialties here and relax by refreshing yourself with a real frappe. It is also worth delving into the thicket of narrow downtown streets, which are surrounded by dense buildings. Strolling around this part of the city you can certainly find many charming corners and interesting details. Some streets have been turned into a pedestrian street, along which there are a lot of taverns, cafes and shops, which, unfortunately, mostly offer typical tourist trash (made in china), but you will also find stores specializing in the sale of local products. You can easily buy things such as Cretan honey, olive oil, the highest quality spices, ceramics, gold jewelry or olive wood products. 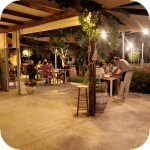 Near the Lake Voulismeni there is the Folklore Museum presenting local crafts. In seven halls of the small Archaeological Museum, items from the Neolithic period to the end of the Greco-Roman period were staged. One of the best-known exhibits that are exhibited here is the skull of a man (most likely athletes) with a gold laurel wreath and a silver coin intended for a fee for crossing the Styx River. Agios Nikolaos is also an excellent starting point for exploring the eastern region of Crete. In close proximity to this city are excavations of the ancient city of Lato and Kritsa , or the most famous village of Crete. It is also worth visiting the Byzantine church of Panga Kera located just off the road leading to Kritsa . About 10 kilometers north of Agios Nikolaos lies the picturesque town of Elounda with the remains of the ancient city of Elous . From Elounda, just like from Agios Nikolaos, there are ships transporting tourists to Spinalonga, a former island of lepers, and now one of the major tourist attractions of this region of Crete. Unfortunately, Agios Nikolaos can not boast of such good beaches as some of the cities of Crete. By far the largest and the best is the Ammos beach, which, according to its name (amnos means sand) is sandy. This beach is located behind the marina in the south-east of Agios Nikolaos. People who want to spend their free time more actively can rent equipment for diving in a small marina, which is located in the Coral Hotel below the street leading along the coast. There is also a small concrete platform on which are sun loungers for rent. It's hard to call it a beach, and rather we do not recommend recreation in this place. Agios Nikolaos is located roughly halfway between Heraklion and Sitia. The easiest way to get to this city is by driving the New National Road. Agios Nikolaos is also well connected with the Ierapetra located in the south. These cities are connected by a road that runs through the narrowest part of Crete. In this place the island is only a dozen kilometers wide. Until recently, Agios Nikolaos also had a sea connection with mainland Greece, but currently there are no flights to Piraeus. Heraklion (Iraklion) is the largest city of Crete. With almost 140,000 inhabitants, it is the fourth largest Greek city. Together with the neighboring towns, it forms an agglomeration of around 200,000 people. The important role played by Heraklion in Crete is underlined by the fact that the city is also the administrative capital of the island.